The spring came then left in the rainy pacific northwest and my twitter stream has been filled with others from around the world sharing my woe about dark rainy days. 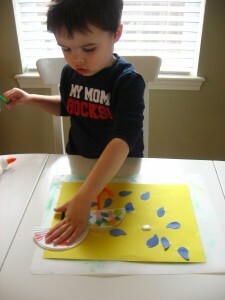 This rainy day craft is a perfect way to talk about the weather , have fun and create. Hopefully, the sun comes out soon and we can all get back to the best part of springtime, being outside! 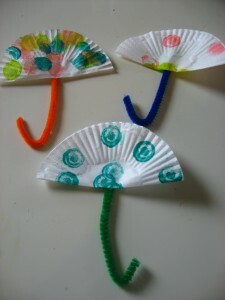 Hope you love our cupcake liner umbrella craft as much as we do. Gather your materials. 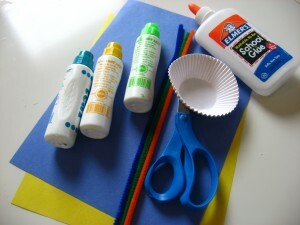 You will need some construction paper ( any light color), some blue paper, scissors, cupcake liners (or coffee liners but you’ll need a larger piece of paper), some paint or markers, glue, tape and pipe cleaners. 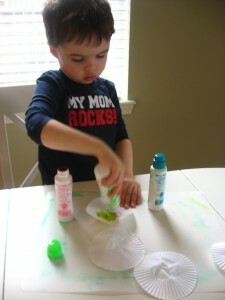 Start by having your child paint or decorate the cupcake liners with markers. We are using our Do-a-Dot Art which we love, but markers would be great too. 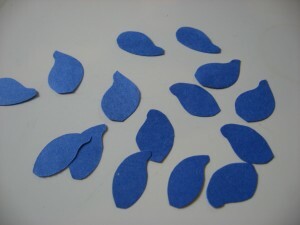 While they do that cut out some big fat raindrops out of the blue paper. 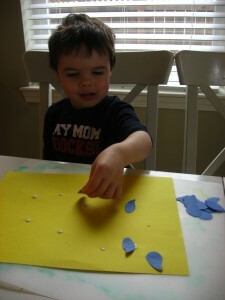 Add some glue dots to the paper. Add your rain drops. This is where I usually ask questions about whatever we are making especially if it’s something literal and not free expressive art, So I will say something like “Where does rain come from?” “Do you like the rain?” He shares his thoughts, I lead him to more questions and the facts. 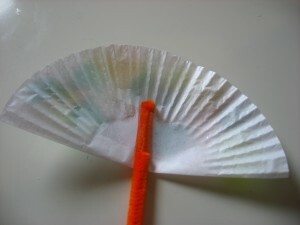 Fold the cupcake liners in half or cut. Then I bent and added the pipe cleaners to the tape. Add more glue for your umbrellas. Add the umbrellas and let dry. 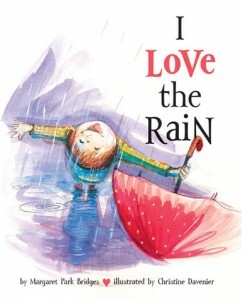 I Love The Rain by Margaret Park Bridges is a sweet book about relishing the wet weather instead of hiding from it. Two little girls are on their way home from school, one hiding under her umbrella the other tongue out loving the rain. With a little encouragement, both girls are loving all the amazing things about rainy weather, from racing raindrops on the bus windows to comparing the sounds of the rain to tap dancers! Living on the rainy west coast I love books about rain and it was an instant hit with my son. 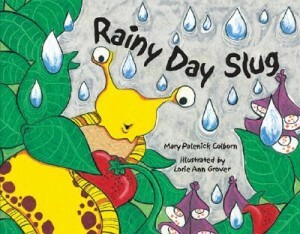 Rainy Day Slug by Mary Palenick Colburn is a slimy story about a banana slug that makes his way from the garden through a yard, and into a house. My son loved this simple book. When the slug makes his way into a little boy’s bedroom and eventually across his cheek, which wakes him up with a startle which my son thought was amazingly entertaining. We also loved the references to Seattle. A painting with the Space Needle and a Mariners pendant in the little boy’s room. I was impressed my son picked up on it. 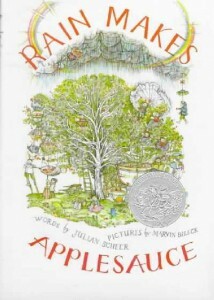 Rain Makes Applesauce by Julian Scheer is a fantastical book. It’s obtuse and silly and my son didn’t get it at all. I liked the fantasy of it. Each page has silly statements with coordinating detailed illustrations by Marvin Bileck that really steal the show. Followed by “And rain makes applesauce”. My son did catch on to the repetition quickly and enjoyed adding it after each page. That said when I asked him what he thought, he said: “I’m not going to read it again, it was too silly, but not funny silly”. I think he is simply too young to appreciate the book. Although wonder if he’d be interested by the time he is old enough to, I hope so! This book is out of print but many libraries carry it so check it out! For more fun rainy day activities, make sure to follow me on Facebook! 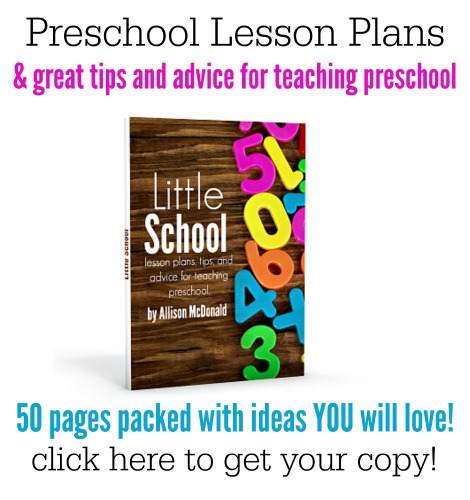 If you teach preschool or preschool at home, you will love my Little School my ebook of preschool activities. Very nice and easy craft..though I liked his T-shirt which says “My Mom rocks” 🙂 You really do !! 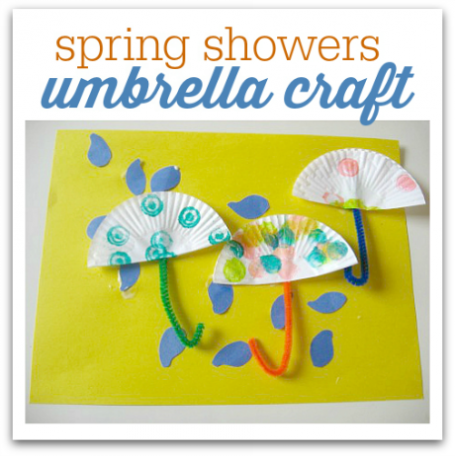 Great rainy day craft. I need to buy more bingo dabbers-such a fun art supply and coffee filters are great for crafts, too. .-= Jen´s last blog ..Wordless Wednesday: Sleeping Beauty =-. I love this one! We’re in New England and have been in the rain for weeks now – this is the perfect craft for yet another rainy day. What wonderful umbrellas! We need them here too – spring seemed to have sprung but now it’s cold and wet once more. .-= Zoe @ Playing by the book´s last blog ..Nonfiction Monday â€“ The Planet Gods =-. This is so cute! I love using coffee filters for an art project because for some reason we have a lot of them in our house and really no coffee drinkers. We’ve had a lot of rain, but I try to be really positive with my daughter because rain gives us green grass and beautiful flowers. .-= Rebecca´s last blog ..Science Experiment: Why No Flood? =-. Oh my! i can’t believe this. I made a smiliar activity for my boy! Yes, i totally agree, its an awesome way to talk about the weather. .-= EL´s last blog ..Letter of the week ‘E’ =-. Love your son’s shirt! And the craft too! I always get so embarrassed when I take him in public with that shirt LOL I didn’t even notice he was in it until I was uploading the pictures late last night. 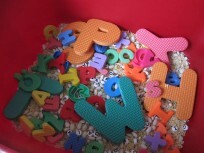 It was a gift from a dear friend , my son loves it cause MOM is one of the words he can spell! wow! really adorable idea. my boys will enjoy this so much! .-= jeana´s last blog ..A Thankful Heart =-. These are so so cute, I can’t wait to make these with Emily! .-= Michelle´s last blog ..Muffin Tin Monday ~ Blue and Purple =-. 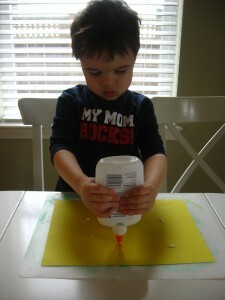 what a sweet craft – my S would love to cut the paper too. I think this is one that will keep her busy for a long time. .-= Maya (Memetales)´s last blog ..10 ideas to get your kids to read more books =-. We did this yesterday. Lots of fun! Thanks! .-= Melodie´s last blog ..A Successfully Breastfed Adopted Baby Via Induced Lactation =-. 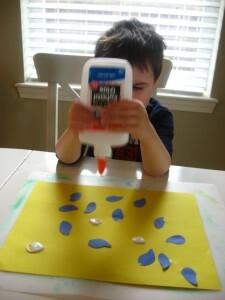 Love this idea, but messy is fun… try using fingerprints for the rain drops!! What a fun project! 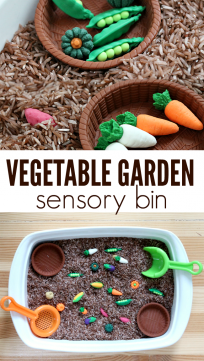 It’s nice to find simple projects that develop fine motor skills and look good when a child finishes. My neighbor is a preschool teacher. I’m sharing this with her. This craft is lovely!!!! Your ideas are really good!